I’ve never been to a show quite like it before; the Spezi is as much about the people and the cycles they arrive on as it is about the trade stands. With a test track, a race track, three indoor halls and a large outside display area there was plenty to see and do. 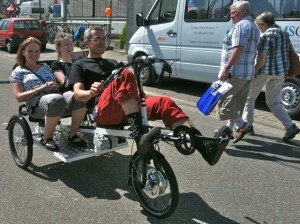 We stayed about 6 miles outside the show’s location Germersheim in a small town called Belheim, cycling in and out over the two days. It’s immediately apparent that this show is a magnet for people with disabilities, along with my own there are various limps, sticks, crutches, frames and chairs on display. I had several conversations with other amputees. 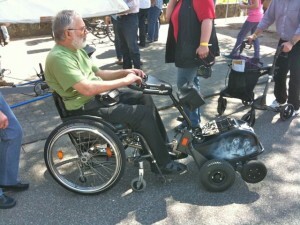 Some of the traditional mobility aids are as interesting as the cycles. This electric tractor unit hooked onto the front of the chair frame is highly manoeuvrable. 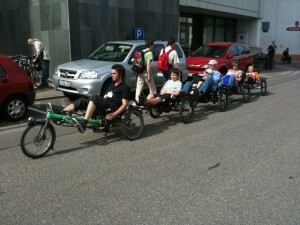 Getting to the show from the train station is made easier by various rickshaws and the Hase Kettwiesel train; removing the front wheel and attaching the front forks to the trike in front creates a self propelled bus. 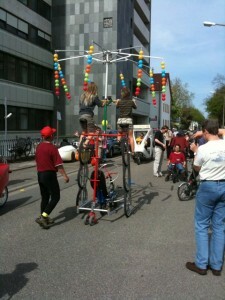 There are also some bizarre contraptions. 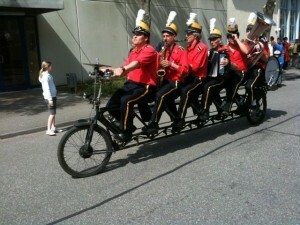 Along with some entertaining ones; this is a functioning six piece band! 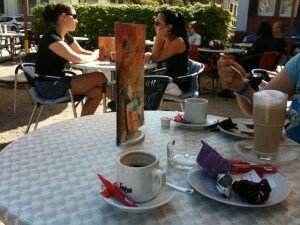 Of course we needed regular coffee or ice cream breaks throughout the day. Inside the halls we found this Anthrotech, a favourite of our own Chris Davies, it has a dualdrive rear hub – that’s a combination of 3 speed hub gear and 8 speed derailleur which makes changing gear while stationary possible. 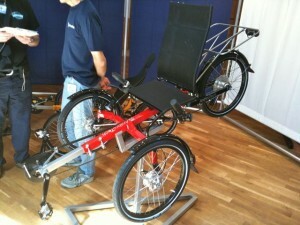 The seat height is relatively high making getting on and off easier. 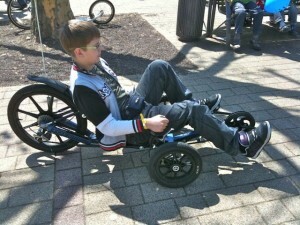 Van Raam is a new name to me and a pleasant surprise, not least because of the variety of cycles they had on display. 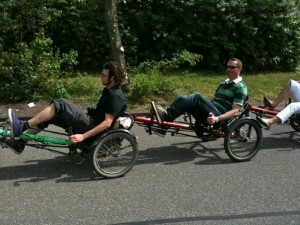 Pictured are trikes for children through to adults, and a tandem putting the child in front. One of the main differences between the UK and our northern european neighbours is the attitude to gears. 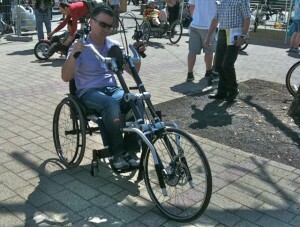 Not one upright trike had derailleur gears. 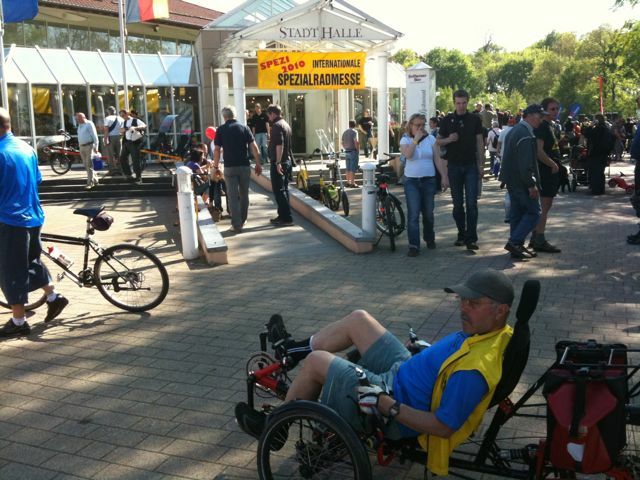 A Van Raam representative asserted that the fact they’re cheaper than hub gears is of no consequence, the benefits of hub gears, particularly for the less able, far outweigh the price differential. 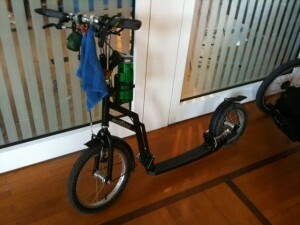 Ruth will appreciate this – a visitor’s scooter bike in one of the halls. 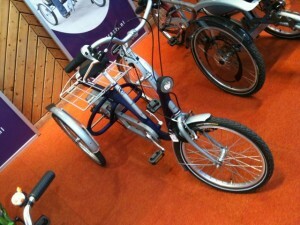 Moving back outside, there are several child sized trikes being manufactured – this one is the british made KMX. 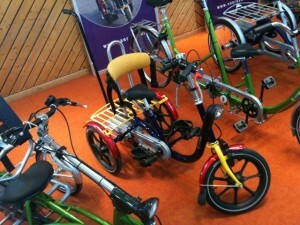 A variety of handcycles and adaptions. 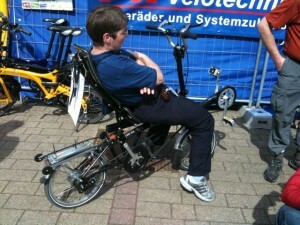 The very exclusive recumbent Brompton. 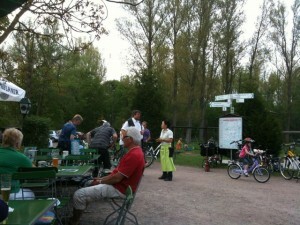 And a pleasant cycle ride away, the beer garden in the woods for relaxing at the end of the day. 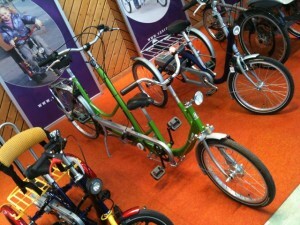 The Test Track where visitors could try out the cycles. And for the technical, some variable mechanical advantage footage. The trip was organised by Peter Eland and Sue Archer of Velo Vision magazine, which if you haven’t seen before you’ll find a sample copy at Exact Editions. There are many more interesting pictures and footage of the show to be found in Peter’s Report and Sue’s Video. 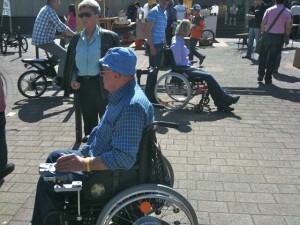 This entry was posted in Inclusive Cycling Forum and tagged bikes, disability, german, mobility, video, words on Sun 16 May 2010 by kevin hickman.